This riad has recently been restored in a style of architecture and typical Moroccan decoration. You will access 3 different entries including a quasi private overlooking a small square, just 50 m from the souks and shops. A cook who prepares your meals according to your requests and takes care of the daily cleaning of the house. Ideal place for holidays with friends and family. Because everyone can find "his corner"
Not recommended for people with reduced mobility because of the stairs. Possibility of babysitting on request. The house is beautifully presented with full attention to every detail and is almost boutique in style, yet has a huge surface area. Close to the hustle and bustle of the markets and everything in Taroudant, whilst being tranquil inside. Wow. As unbelievable as the photos of this place are online, this riad is even more stunning in person. It is palatial, with lots rooms, terraces, and courtyards to explore. The pool is magnificent. The property manager Mahjoub is so friendly and provides incredible service. For the price, which is really low, this place is such a bargain. We have stayed at many nice rental properties on vacation, but this was far and away the best. Dar les Dattiers c'est le paradis. Ma quatrieme visite et la premiere visite pour mes amis, qui l' avait adore. La cuisine superbe de Chadia et les adresses gentils de Majoub. J'ai envie de retourner toute de suite mais hélas pas possible. Our stay and event at Riad Dar les Dattier was one of the best experiences I've ever had. First off, planning my stay and event with Henri went very well - Henri responded quickly to my many inquiries and changing plans. The Riad is unbelievably spectacular. Two courtyards, endless rooms, several rooftop outdoor spaces, many downstairs outdoor spaces, open bedroom concepts, beautifully designed bathrooms throughout the house. The photos on the site do not do it justice. The staff was excellent and attended to our every need with both kitchen service and clean-up. The food the kitchen staff prepared was of excellent quality and delicious. The pool and the lush greens around the outside made the place even more beautiful. The beds were very comfortable and the house was cleaned well for our stay. 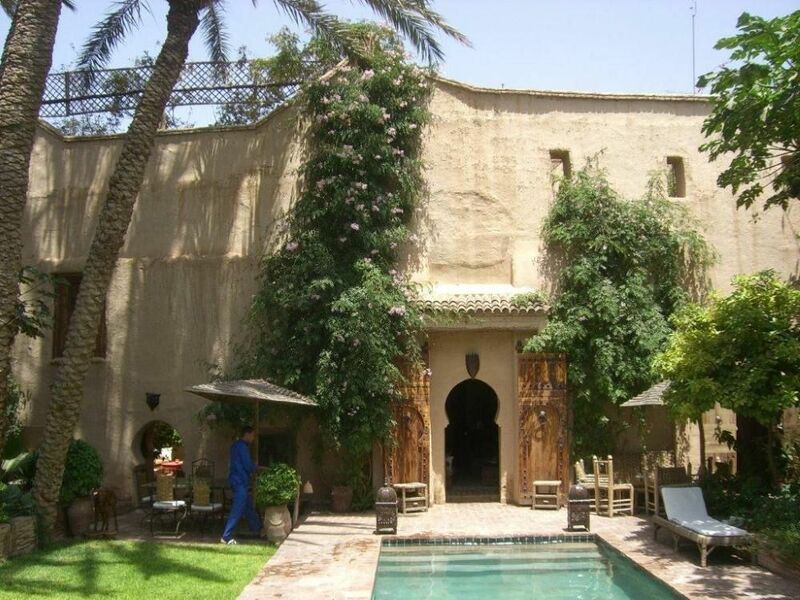 The Riad was centrally located in the heart of Taroudant with convenience of everything we needed at our hands. I look forward to staying again this coming summer and many more to come. La sérénité au coeur de la médina, un cadre enchanteur avec ce jardin et cette piscine "comme au cinéma ", un service attentif. Une perle vous dis-je. Endroit délicieux entouré de murs qui isolent totalement de l'agitation du centre ville de Taroudant. Les cours, les terrasses, le jardin, la piscine, tout est fait pour un séjour agréable et reposant. Mahjoub à notre service aidé de Kadija et Najat en cuisine nous ont déchargés de tous soucis avec beaucoup de patience et de gentillesse. En famille à 18 sur 3 générations nous avons vécu une semaine très agréable. Merci à Henri de nous avoir permis un séjour aussi réussi, sans oublier l'aide et l'accueil de Hassan. Located inside the Medina of Taroudant in the heart of one of the oldest cities of the Kingdom, unique 2 riads and a garden set with: pool, jacuzzi, hammam. It is the ideal place to live in contact with the local population while being in a safe place, isolated from the noise of the city and surrounded by a beautiful flower garden and plant palm trees and orange trees with swimming pool and outdoor Jacuzzi. Only 50 meters from the souks, you can stroll through the streets of the city known as 'Little Marrakesh', discovering the stalls of small traders and local crafts. The Taroudant region is known for its citrus groves, its argan oil cooperatives and olive oil, its varied handicrafts (leatherwork, pottery, tannery ...) and beautiful mountain scenery . Nearby: carriage rides, exploring the souks and Moroccan crafts, business argan oil cooperatives, walks, horse riding, tennis, golf and beach Agadir, visit the surrounding palm groves and explore the area Taroudant.